If you’ve seen my Sub-Zero Cosplay Review, then you’ll know why I had to modify this cosplay. And if you’ve watched the full modification video– welcome! You’ve come to the right place! 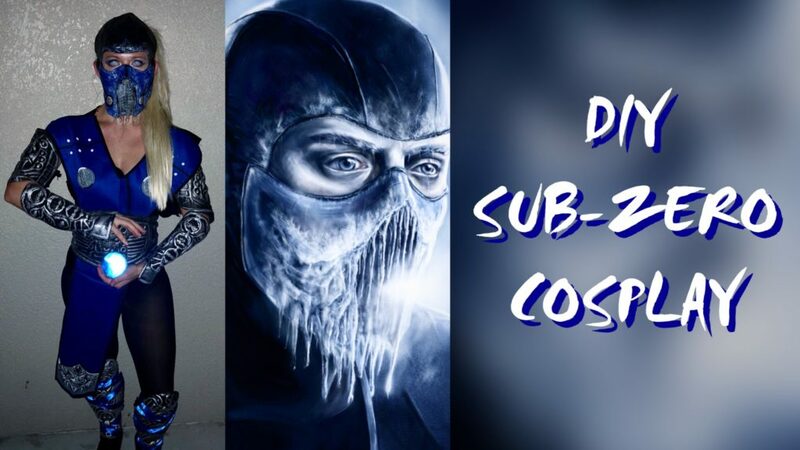 This is the Cosplay Supply Link for my Sub-Zero cosplay that lists everything I used to make this costume (including the contacts, base piece, etc). Here is everything that I used to modify my Sub-Zero Amazon cosplay! For full instructions, make sure you check out my YouTube video. Paint the inside of the ornaments with different colored blue nail polish. I would drip a little bit in the orb and then swirl it around with the nail brush. I started with the lightest colored nail polish (an obaque blue glitter) and ended with the darkest nail polish (midnight blue). You don’t really have to wait for the layers of nail polish to try; just blend it all together! Then, just tuck in the white tulle (to diffuse the harsh light), and the LED light (the LED I listed above are remote control and can be various different colors!). The prop you see in the photo above is actually this option. I used blue reflective tape on the inside of the globe. When you use flash photography, the tape will automatically give that fluorescent glow. I tried taping this specific tape to the outside, but the material is too thick for it to work. However, thinner white tape (such as Scotch Reflective Tape) should be easy enough if you just want to put the tape around the outside of the ornament. Because the tape I use is so thick, I traced the size of the ornament on white paper, and then laid the tape down on top of that circle. Then I retraced the ornament on top of the reflective tape (use a permanent marker so you can see it) and cut out the circle. In order to place the flat circle inside the globe, I cut a line to the center of the circle so that the reflective tape could bend to fit inside. You’ll need two of these (one for each side of the ornament). Lastly, put four dabs of hot glue on the inside of the ornament. Push your circular reflective tape piece underneath that once it dries, and it should stay. Do the same to the other side, close up the ornament, and you’re done! From the side, you won’t be able to see the blue reflective tape so make sure the blue is facing frontwards when you’re taking photos. This is why taping the outside is a viable option since you won’t have to worry about that. But as I mentioned, the specific tape I bought isn’t flexible enough to fit the ornament. You can also add fishing wire to the bottom and top loops that come with the ornament in order to create a suspending effect (I’ll update when I actually do this)!